“The Lord said to Moses on that day he brought the sons of Israel out of the land of Egypt. He said: Consecrate to me every firstborn; whatever opens the womb among the Israelites” (Exodus 12:51). 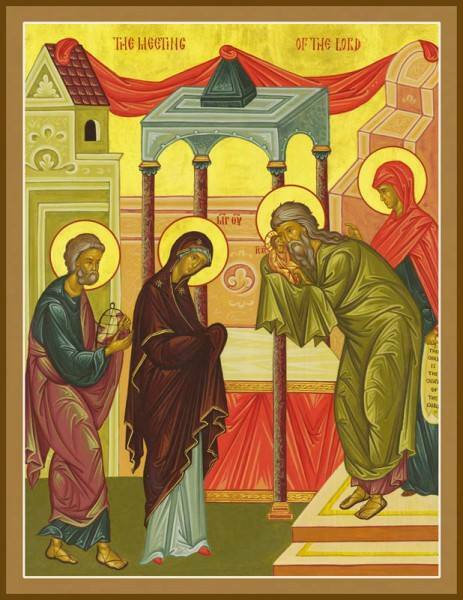 In this feast, the last of the Christmas cycle, the Feast of Light, Mary and Joseph bring the child Jesus to the temple to fulfill this commandment. The Irmos of Ode 9 of this feast expresses this in song, “O faithful, let us recognize the figure of Christ foreshadowed in the letter of the Law which says: Every male child who opens the womb is sanctified to God. Therefore, the first born Word and Son of the Father without beginning, the first-born of a mother who had not known man: him, let us extol.” This is a beautiful perfection of God’s law for our salvation. “For just as in Adam all die, so too in Christ shall all be brought to life, but each one in proper order: Christ the first-fruits; then, at his coming, those who belong to Christ” (1 Corinthians 15:22-23). Today, however, we offer to God his and the human race’s first-born Son. This feast tells us that we should always offer to God the first-fruits, our very best, for Christ is the Alpha and the Omega, the beginning and the end, and God gives us all that we are or that we have.